﻿ Household matters: how to organise housework with your family? 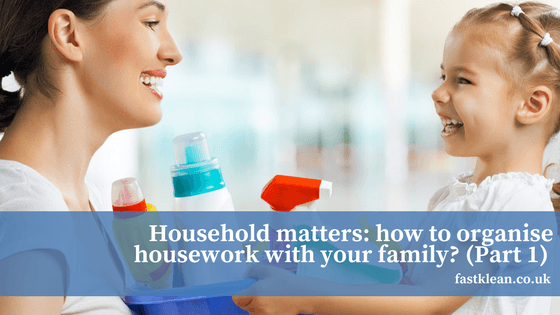 HomeCleaning TipsHousehold matters: how to organise housework with your family? Household matters: how to organise housework with your family? Whatever type of place you share with your family – an apartment, a house, a mansion, etc. – there is one thing you always need to address: housework. Every home comes with hefty requirements in regards to keeping it clean and tidy, else it becomes a mess. If you think that housework, such as cleaning and decluttering is nothing but a trivial matter, you best rethink your stance. More and more UK couples that seek marriage counselling and one of the culprits lies with arguing over chores occurs as often as once a week. According to this Daily Mail survey, every one in five couples has regular quarrels over chores or has in fact broken up over such matters. It is only normal to take home hygiene and cleaning needs seriously, because these tasks fall in the category of ‘demands of the modern life’. You cannot expect to have a thriving family if one or more of its members are always grumpy about someone else’s hygiene or lack thereof. You need to establish rules and discuss house cleaning just as you would discuss other matters, like family budget for instance. Discuss cleaning matters frequently – like it was already mentioned, discussing cleaning matters with the whole family is very important. It is funny how people assume their loved ones will just adopt certain cleaning standard without even discussing it. You cannot expect people to follow your rules without first discussing this thoroughly with them. Ideally, you want to have this talk with every single member of the household; your significant other being top priority. You don’t want to argue about cleaning chores constantly; not when you can instead discuss what each of you considers appropriate cleaning commitment. Once both of you know what to focus on, you can move on to how to accomplish it and work together for that goal. ‘Sit down and talk about it’ sounds so easy to be true, but it is! Yet, many people don’t do it and instead suffer the consequences when suddenly one decides they have had enough. Make it a point to talk about cleanliness with your partner and do it often. Your relationship can greatly benefit from this. Educate family members on hygiene – apart from only discussing cleaning matters such as how, when and what to clean, you should also talk about hygiene in general. It is best to be on the same page of cleaning with everyone at home. Every family member should know why it is important to clean and what the benefits of keeping the environment at home fresh and tidy are. This is also a fantastic way to motivate others to clean more. For instance, you can share information that the screens of smart devices are in fact known to contain more bacteria per square inch than a toilet seat. If anything, this will get them to clean their devices more often, which ultimately benefits them. While that is more of a personal matter, you can also talk about things that affect the entire home. For example, shoes collect an enormous amount of bacteria and other nasty stuff, yet many people don’t think about it and walk freely with their shoes on inside the house. Tell them the facts and change their views on the matter: it is not hygienic at all! Naturally, such talk should be had with children mostly, especially when you want to teach nice and healthy in them. However, a lot of adults can too benefit from a little extra knowledge on how to keep their homes clean. Different people can address different aspects of cleaning – many household tasks are considered difficult because of the huge effort required by a single person to address them. However, almost every task can be broken down to small and easily manageable bits, which different people can make short work of. For example, vacuuming is generally not that difficult, but if one person has to do the entire home, it can get overwhelming. Why not have your partner vacuum two rooms, while you later handle the others? Also, this is an easy enough task, in general. However, if you count in any furniture lifting to vacuum underneath, it does become tougher. That is definitely one aspect of the job that the man of the house needs to take care of. Each of these 3 approaches can unite your family together on the quest of living in a cleaner and more organised home. Starting today, you can implement them all and see just how much of a difference they make. We will share even more strategies on how to organise household work at home in part 2 of this article, so stay tuned!